What makes this recipe popular at tasteofBBQ is how it makes cooking beef short ribs taste just like a traditional Korean recipe. 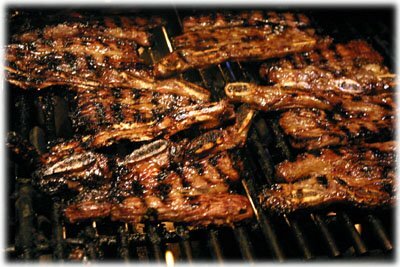 Known as Galbi in Korean cuisine it refers to grilled marinated beef short ribs and is rated 44th on Worlds 50 most delicious foods readers poll compiled by CNN Go 2011. I've tried a few beef short ribs recipes and always come back to this one. The familiar nutty-sweet sesame flavor of the Korean BBQ marinade recipe just seems perfect with these beef short ribs. 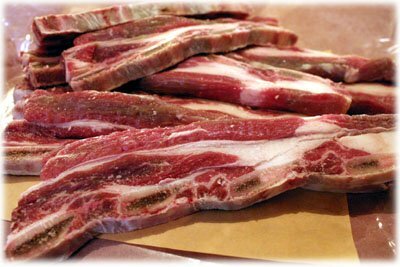 You'll likely need to ask your butcher to cut you the beef short ribs, make sure you ask for flanken style about 1/4" thick. See the pictures below so you'll know you're getting the right cut. You'll notice some unusual ingredients in the Korean marinade recipe below, for instance Asian Pear (see picture in step-by-step below). 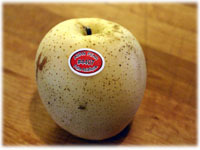 If your supermarket doesn't stock this item just use a regular pear. For best results soak the beef short ribs in the marinade recipe overnight. If you're in a hurry for a faster marinade recipe to make try this one from one of our other beef shish kabob recipes. It still needs to soak overnight though. It's typical when cooking short ribs this style is to set the grill to medium direct heat, around 500F then after flipping them the first time reducing the heat to lower, 400F or so. They'll take a little longer and be cooked more well done but that seems to taste the best for these. It also allows most of the fat to render out. Keep them moving around the grill and it's OK to flip them a few times to prevent them from flare-ups and burning. Direct Heat: 500F to start then 400F to finish. Peel, core and chop the Asian pear. 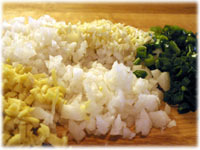 Chop the 3 green onions, just the main green part of the onions. Peel and chop the 1" of ginger and the 2 garlic cloves. In a medium sauce pan add the chopped marinade ingredients. 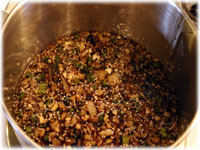 Add the remainder of the marinade ingredients to the sauce pan and bring to a gentle boil over medium high heat. Reduce the heat and keep at a gentle simmer for 5 minutes. Remove the marinade recipe from the heat and allow to cool. 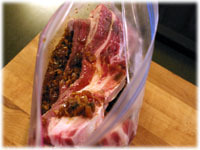 Place the beef short ribs in a resealable plastic bag and pour in the marinade ingredients. Gently manipulate the ribs in the bag so they're completely covered in the marinade. Place the bag in a shallow dish to prevent leakage and put in the refrigerator overnight. Turn the bag over several times if possible while the short ribs recipe marinates to keep all the ribs covered with the sauce. Preheat your grill to 500F and set up for direct grilling. 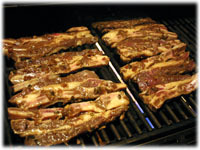 When the BBQ reaches this cooking temperature remove the short ribs from the bag and place on the grill. Close the lid and allow to cook for 6 - 8 minutes. You can either discard the used marinade or bring it to a gentle boil for 10 minutes and reduce it (and sterilize it) to a drizzle for the ribs when you serve them. With the sugar in the marinade you'll want to keep an eye on the ribs so they don't flare up too much and burn. After 6 - 8 minutes go ahead and flip them over. They should be browning up nicely with grill char marks. Reduce the heat to about 400F and close the lid for another 8 - 10 minutes but check on the short ribs recipe now and then to prevent them from burning. 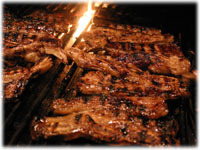 Keep the ribs moving around the grill and flip them over several more times until you have the ribs cooked to well done. 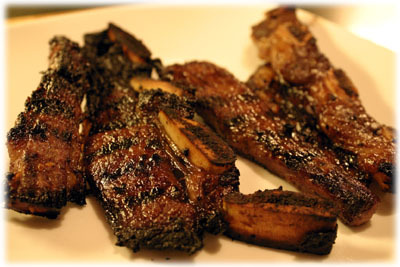 When fully cooked, remove the short ribs from the grill to a serving platter and let rest for 5 minutes. The meat should be pulling away from the small bones. If you reserved the marinade and boiled it down to reduce it and sterilize it then you can drizzle the sauce over the ribs as they rest. 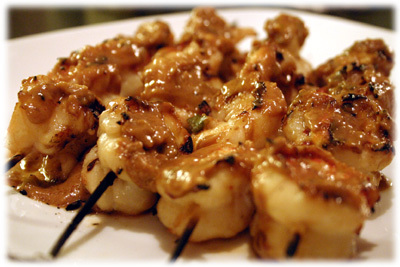 These are great served with a rice side dish.